Deventer: An efficient route for cycling in a city which has much to offer. A few days ago, Ranty Highwayman wrote about visiting Deventer. He covered the central streets quite well, but unfortunately, the central streets are not where you find the best developed cycling infrastructure in that city. Therefore, I've brought forward a long overdue blog post about Deventer, including a long video which I shot back in April 2014 just after a new cycle route had opened. Efficient cycling infrastructure isn't limited to one corner of the Netherlands. Actually, there are great examples of infrastructure across the country. We run our study tours here in Assen and sometimes look very closely at particular aspects of the infrastructure in this city. Assen is better than average even for a Dutch city, but there are quite a lot of places which have better than average infrastructure and had we settled elsewhere in the country we'd have taken a closer look at what was on offer there instead. A ten minute long video (sorry!). This shows most of a very high quality newly reconstructed route for cyclistswhich runs all the way from suburbs and villages to the east of Deventer right to the centre of the city. This is very good infrastructure even by Dutch standards. A friend of mine (who does something entirely different on youtube) lives near Deventer so Judy and I have visited that city several times. I've cycled every cm of several possible routes along the 100 km which stretch between Assen and Deventer and occasionally written a little about the city on this blog or elsewhere. Deventer's a very pleasant city to visit. The ancient central streets are popular with shoppers and also a pleasure to cycle in. When people have asked me about other places which have good cycling infrastructure, I've sometimes suggested Deventer as another of those relatively unknown places in the Netherlands which is better than average. Another day, another view. This is top quality infrastructure for efficient cycling. Efficiency is essential to make cycling attractive even for longer journeys. It's only by addressing all journey lengths and all journey types that mass cycling becomes possible. Deventer also has other good examples of infrastructure in its suburbs such as this bicycle road. Another view of the same bicycle road. The through route for bikes has priority over the minor route for motor vehicles. Just as in other Dutch cities, through traffic has been diverted around the city centre in Deventer. The old central streets now carry a great deal fewer motor vehicles than they once did. When routes have been unravelled and motor traffic removed, city centre streets don't require obvious cycling infrastructure. The old streets in the centre of the city don't look the same now as they used to at the height of car oriented thinking back in the 1960s and 70s. Cafe "culture" appears when cars are removed from cities. Occasion delivery vehicles, but otherwise the central streets are for cyclists and pedestrians. The centre streets of Deventer are used only by cyclist and pedestrians, except for service vehicles and those which set up and remove stalls on market days. Note how quiet these streets are: while tidying up, this driver can pull four trailers at once without causing any problem for anyone. Ranty Highwayman's blog post, linked above, shows many of the central streets. I've cycled between Assen and Deventer on many occasions. In this case, catching up with racing cyclists who are as is entirely usual in the Netherlands, using the same high quality cycle-paths as everyone else. Here entering a village with a low speed limit on a quiet country road. Country roads in the Netherlands have traffic unravelled from them in just the same way as do city centre streets. My route sometimes includes the town of Raalte, a town where cycling success was achieved for just the same reasons as elsewhere in the Netherlands, though a mistranslated article suggested otherwise. Just because something exists in the Netherlands, that doesn't imply that it's good. Just as with other Dutch cities, not everything is perfect in Deventer. Like other places, Deventer has a mixture of newer and older infrastructure. In particular much of cycling infrastructure near the city centre appears to be quite dated. Some things have been done better than others and in some places mistakes have been made. For instance, Deventer has at least one safe Simultaneous Green junction which has a perfect safety record for cyclists, but the adopted a less safe roundabout design resulting in a roundabout being the most dangerous junction for cyclists in the city. More worrying, recent removal of separate cycling and walking provision within an industrial area mirrors a change in Hoogeveen which had awful consequences. Because I don't spend much time in Deventer, I don't know the details of what is happening there so it wouldn't be wise for me to organise study tours in that city. While there are good examples across the Netherlands, on our study tours we take a very close look at the two cities of Assen and Groningen. These are cities in which we spend a lot of time and which we know well. We don't travel from place to place on these tours as that would mean giving a helicopter view of highlights which would be misleading. Instead, by looking more closely at a small area we can present a balanced and representative view of the whole, including examples of what works and what should not be copied. 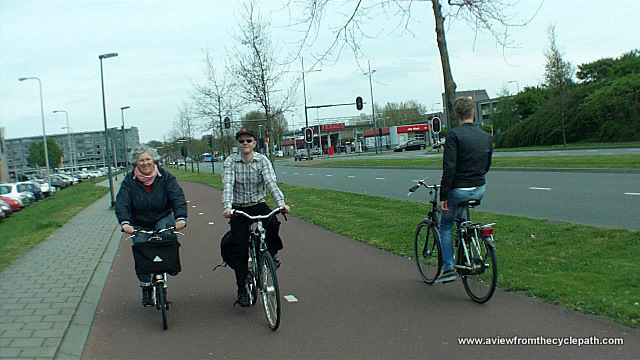 To find out more about Dutch cycling infrastructure, book a tour.